When you’re enjoying a getaway to the Mustard Seed Bed and Breakfast on the Llano, it’s easy to beat the Hill Country’s summer heat. You can have plenty of fun cooling off at some of our nearby state parks. Inks Lake State Park is just half an hour east of Llano on TX 29. It offers swimming, boating, fishing, hiking, picnicking, and even geocaching. Its sister, Longhorn Cavern State Park, guarantees it’s always a cool 68 degrees in the cave! Longhorn Cavern State Park is only 10 minutes farther beyond Inks Lake, so it’s easy to visit both on the same day. At Inks Lake State Park, the Devils Waterhole scenic overlook provides an expansive view of the lake. Nearby, the Devil’s Waterhole and Spring Creek Delta are great choices for swimming (no lifeguards on duty). 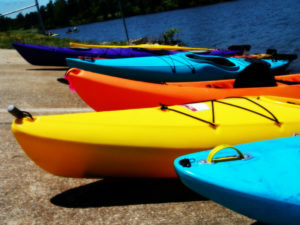 Both locations also have kayak and canoe launches and the lake has designated a large no-wake zone for paddle craft. You don’t need to bring a boat -visitors can rent kayaks, canoes, paddle boats, life vests and paddles at the park store. If you’re in the mood to relax with a fishing pole in your hands instead of a paddle, you can try your luck fishing for bass, catfish, and sunfish. The park has two fishing piers, fishing tackle, bait, and cleaning station available, and no license needed to fish there. Visit the park’s website for an interactive map and detailed information about these activities. Inks Lake State Park also offers a variety of Ranger-led activities. Some days, you can join a naturalist in a kayak to learn about the lake’s wildlife, take a Starry Night Hike to see the stars, fish with guidance from a Ranger, or even learn about the weapon prehistoric Texans used to hunt, and try your own hand at throwing the Atatl! Here is the current schedule of Ranger programs. Buchanan Dam and Inks Dam create the boundaries for Inks Lake, the second of the six in the Highland Lakes Chain. Pink rock outcrops of Valley Spring Gneiss can be found along the limestone hills bordering the lake. These formations create unique microhabitats for all kinds of plants from ferns that grow in arid climates to spikemosses underfoot. Plants such as rock quillwort and basin corn salad can be found nowhere in the world except this area. A great way to explore the park’s special geology, flora and fauna is a nature walk or hiking trail. Try the short Devil’s Hole Nature Trail (0.2 miles) or longer Devil’s Backbone Nature Trail (1.2 miles). For a longer hike, the self -guided Pecan Flats Trail highlights 28 points of interest including the 1000 foot overlook of Inks Lake. The Trail Map identifies the park’s nine different trails as well as the location of other features. Return to Llano, knowing you can relax in the contemporary comfort of your guest room tucked within our renovated 1870s farmhouse. Perhaps it’s time to sip a glass of Hill Country wine and stargaze as you relax in the B&B’s outdoor hot tub, or stroll down Main Street to the local wine bar. Our bed and breakfast has only three guest accommodations, and each one is unique, so don’t wait to plan your summer vacation in the Hill Country this year. It’s easy to go online and make your reservation. Note that if the park reaches maximum capacity, it closes to additional day use visitors. Plan to arrive early in the day, and call or check their Twitter or Facebook for closure updates. This entry was posted in Texas State Parks, Uncategorized and tagged Hill Country Park, Inks Lake State Park, Llano B&B, Longhorn Cavern State Park, Summer Activities by admin. Bookmark the permalink.